The Squamish Branch of the Bank of Nova Scotia opened its doors for business, on August 16. This community has long felt the need of a bank and a hearty welcome is extended to the staff. Mr T.G. Dunn, the manager, comes to his new post after a year spent on the prairie as a hiring manager for the Bank of Nova Scotia. He will occupy the neatly equipped office just to the left of the entrance. In the teller's cage you will find Mr J.W. Patterson, who is chief teller and comes here from Vancouver. The third member of the staff is a familiar figure in Squamish. Eighteen months ago Ione Magee left for Vancouver to work in the Granville and Hastings Street Branch of the Canadian Bank of Commerce. Now she is back to work as stenographer and ledger keeper. Resident of Squamish and Woodfibre since 1917, Ernest Clester passed away at his Woodfibre residence on August 23rd. Mr. Clester was born in Wichita, Kansas, in 1988 and came to Canada while still a boy. He originally came to Woodfibre in 1920 and soon afterward joined the staff of the Whalen Company, predecessor of the present British Columbia Pulp and Paper Co. Mr Clester was associated with many developments of the Woodfibre plant and townsite. Donald, Mark and Hector Bellamy, Mr. Clester was a member of the Anglican Church. Funeral service was conducted at the grave-side at Squamish by Reverend C.H. Gibbs. Pall bearers were W.A. Bain, O. Van Horlick, O. Briggs, D. Inglish, G. Hopper and J. L. Ferguson, all of Woodfibre. The honor of owning the smallest car in Squamish has passed from Mr Lyle McPherson to Mr Bill Manners. In direct contrast to the heavy, cumbersome vehicles which are so common here, the new midget is a 1/4 ton Crosely pickup in a shiny green color. Reputed to be easy on gas, these small cars may easily start a new trend. Mr. and Mrs. Stanley Mills, after living in Squamish for nearly five years, have left for New Westminster where Mr Mills is now working. On Saturday, August 28th, friends and neighbors gathered to surprise them at their home. Among those present were Mr and Mrs R. Slack, Mr and Mrs Garrison, Mr and Mrs E. Aldridge, Mr and Mrs T. Halvorson, Mr and Mrs M. Halvorson, Mr and Mrs L. Gorsuch, Mr and Mrs R. Watson, Mr and Mrs N. Feschuk, Mr Dennis Downer and Mr Denny Smythe. The guests of honor were the recipients of a souvenir wooden tray on pedestals. The following Wednesday the home of Mrs R. Slack was the scene of a baby shower for Mrs K. Kennedy and a farewell party for Mrs Mills. Needless to say, both guests of honour were thoroughly surprised. Among the ladies honouring the two guests were Mrs S. Frost, Mrs J. Knight, Mrs R. Farquharson, Mrs. P. Drenka, Mrs W. Bazley, Mrs R. Slack and Mrs L. Budgell. Mrs. Kennedy was the recipient of a number of lovely gifts, while the whole group gave Mrs Mills a beautiful vase. Local visitors to the PNE were pleased to note that Mrs A.P. Barnfield and the Branckendale Women's Institute under Mrs E. Judd won a number of prizes. Congratulations, Mrs Judd and Mrs Barnfield. A.R. BARR & CO. LTD.
Every coming issue will be filled with news of interest - news of what your friends are doing - news that you won't want to miss. co-operation in supplying them with personal and other news items along with hints of coming events in your neighbourhood. Mrs Fred Munro, News Editor, Squamish. Correspondents in other parts of the district will be welcomed. Mr W. Stewart has come to Squamish to replace Mr J. Millar, now with the Temiskaming and Northern Ontario Railway. Mr Stewart comes to his new position as superintendent of the PGE after twenty-two years experience with the Canadian National Railways. In 1924 he started with them as office boy and advanced continually, working in various departments on subsidiary lines of the CNR in Canada and the U.S.
With the exception of two years spent with Bethlehem Steel Corporation, Mr Stewart worked continuously for the CNR finally becoming assistant superintendent at Kamloops in 1944. From this post he has come to act as superintendent of the PGE. Mr. and Mrs. Biggin of Exeter, parents of Mrs R. Laser are planning to meet Mrs Dent, her daughter and grandson when they dock at Southampton on September 6th. Visits will be made to numerous relatives of the late Mr Dent at Newmarket and in Yorkshire. Later the travellers plan to visit Mrs Dent's relatives in Ireland. On November 6th they will voard the "Britannia" for the return journey, hoping to be home by mid-November. The Squamish Cash Market is undergoing alterations and will re-open soon as an up-to-date coffee shop. The building, owned by Mrs M. Carson has been taken over by Mrs Martinow. Mr Bill Smith and Mr M. Tyner are in charge of the re- modelling. The building was originally erected for a real estate office some 35 years ago. For some years it was used for a grocery store, first by Tom King, and later by Rod Farquharson. Once renovations are complete, the building will not be recognizable. Plans for the building of the Roman Catholic Church in Woodfibre are under 'way, and it 1s hoped that the work d excavation will be started at an early date. the organ is being stored in the house of Mr. G. K. Hannah. The last big event of the summer season attracted young and old to participate in the Labor Day program at Woodfibre. The day got off to a good start at 9:10 am when the boat race got under way, on one of the few bright and sunny days we have had this year. The race was arranged to cater to all types of boats, the prize being given to the entrant who came closest to estimating the time it would take him to run the course, all watches and clocks being left behind at the beginning of the race. The route was a triangle from the small boat float to near the gravel pit, over to Watts Point, and back to the float, and the times estimated varied from 45 minutes to one hour, 50 minutes and 15 seconds. Apparently the owners of the Woodfibre boats fail to do themselves justice, as in the case of each of the nine entrants the time taken to reach the float was less than the time estimated. The entries were: J. Lawson, W. Knowles, L. Bickell, H. Golden, V. Brait, D. Anderson, K. & N. Erickson, L. Labonte, and C. Bellis. The winner was Dave Anderson, who completed the course in 56 minutes and 35 seconds, with an estimate of 59 minutes; second prize went to C. Bellis (Time 53 minutes, Estimate 58 minutes); third, Jack Lawson (Time 30 minutes, Estimate 45 minutes); fourth, Vic Brait (Time 54 minutes, estimate one hour and 15 minutes). The markers at the corners of the triangle were Mr W.A. Bain and Mr F. Mullin Jr., and Mr J. Henderson acted as patrol. The prizes were presented later in the day, the winner received a barrel of gasoline which was donated by J. Haar and C. Lea. The boat race was followed by the children's sports up at the Ball Park. Potato Race - 14 years and under - Brian Whalen, Alan Chadwick, Raymond Fogolin. The New Veterans Band from Vancouver having arrived on the mid-day boat, the big parade took place early in the afternoon. The band with the Band's Majorettes led the procession, followed by the Woodfibre Wolf Cubs with their new standard, accompanied by their leaders, L. Hobby and R. Jones. The Wolf Pack was dressed in uniform and were a credit to their leaders in their first big parade of the season. They were followed by the children's entries of decorated wagons and doll carriages. Next came the Floats entered by the various departments of the mill and townsite. The entries were: Pulpmill Millwrights ("Mandarin Garden"), Beach Plant ("Ma's Labour Day"), Machine Shop ("Shipwrecked Sailors"), The Engineering Department (More or less as themselves), the P.T.A. ("Home and School"), the Lab, ("Miss Woodfibre, 1948" complete with umbrella). Wood Plant (this could be described as an outsize baby carriage complete with personnel). Local 494 ("4th Birthday Cake"), the Foreman ("Job Incomplete"). The floats were most effective and showed evidence of many hours work on the part of numerous people. They were judged by popular applause, the winners being: 1st - P.T.A., 2nd - Pulpmill Millwrights, and 3rd - Bleach Plant. The parade was completed by the decorated bicycles. The winners of the best decorated bicycles were, first, Alan Chadwick, second, Jimmy Douglas, and Harry Tutin, and third, Marion Tutin. 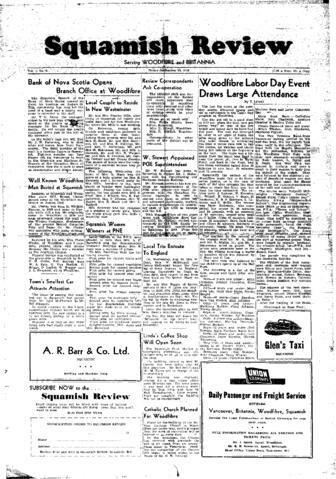 An independent newspaper published on the second Wednesday of each month at Squamish, British Columbia, serving the Squamish Valley, Woodfibre and Britannia Beach. Office of The Review is located in the Yarwoods Drug Store, Squamish, BC. support given to it by its citizens. The business people of the town have its interests at heart or they would not be in business here. They depend upon the people of this district not only for their livelihood but also for sufficient volume of trade, so that they can improve their businesses so as to pass on dividends to the people who deal with them in the form of better service, better variety and better prices. As a trading centre Squamish has improved remarkably during recent years. Many still scarce items are to be found here in fair supply since local merchants are keenly interested in doing all they can to provide their customers with the goods they want. local businesses, part in improvements to the town. Dollars spent out of town never come back. Spent here they circulate, create business, add work and wealth to our own community. It's the dollars that come back that count. It will pay you to trade at home with your "home" dollar. Mrs John Knight of Port Alberni is visiting her parents Mr and Mrs S. Clarke. With her is her two month old son, Warren. Mr and Mrs Ken Farrow and Sady were recent visitors at Royston, V.I. Mr and Mrs Walter Mitchell were guests at the home of Mrs Pete Meehan. Mr and Mrs Hans have as their guest Mr and Mrs B.P. Pollock and family from Saskatchewan. Mrs Pollock is Mrs Hans twin sister. Mr and Mrs Earl Baity with their daughters, Lorraine and Hatty are visiting in Vancouver. The quilt which the W.V. members are making will be raffled this fall at their annual tea and sale of work. Mrs Frank Haas and children Sue and Connie Ann from California are guests of Mrs Haas' parents, Mr and Mrs Ted Tutin. Mr and Mrs E.T. Judd are on a motor trip to Calgary. Berry Barreau will be a pupil at Vancouver College this year. Mrs M. Long of Nanaimo is returning to her home after spending two months here with her son and daughter-in-law, Mr and Mrs V. Long. She will be accompanied by Mrs Long; Beverley, Lyall and Jackie Long, who will spend ten days with her. Mrs H. Brightbill has gone to Quesnel for a holiday. Mrs John Kenmuir and her daughter Marion from Powell River are visiting the former's sister, Mrs J. Eadie. Another niece of Mrs Eadie's, Paulene McDonald of Wellington, V.I. is also visiting her. Miss Barbara Webster who is new a full fledged teacher is going to try her wings in a small school in the McBride district. Miss Pat Edwards of Vancouver is combining business with pleasure. She is visiting her sister, Mrs J. R. Buchan; and at the same time working in McKenzie's hardware department. A graduate of the Vancouver Normal School, Pat has accepted a position as P.T. instructor in Cloverdale. Miss Marion Fadie of Shalalth is visiting her parents, Mr and Mrs J. Eadie. Mrs Bergman, who came all the way from Holland to visit Mr and Mrs J.D. Manners has returned home. She arrived in Rotterdam aboard the Veendam on August 17. Her three sons and daughter and their families, motored 135 miles from s'Hertogenbasch to meet her. Mr and Mrs George Mableson of Williams Lake spent a couple of days recently with their daughter Mrs R.H. Paul. Mr and Mrs Manual Seymour have left for a lengthy holiday at Celista on Shuswap Lake where they will be the guests of Mrs Seymour's mother; Mrs W. Tracy. They were accompanied by their two small daughters, Diane and Barbara. Mr Burton Webster paid a flying visit to Squamish over a weekend and looked up a number of old friends. Mrs Norman McDonald was the guest of honour at a baby shower held at the home of Mrs Scott McDonald. Mr and Mrs Foster; and Mr and Mrs Earl McDonald with daughter Valerie and niece Shirley came from Edmonds, Washington for a short visit with Mrs Foster's sister, Mrs R. McNeil. On their return to Vancouver they will motor up the Cariboo Highway to visit Mrs Foster's niece; Mrs Alex McDonald of Williams Lake. Mr and Mrs E. Stathers spent a pleasant week at Sky Blue Water Resort at Pavilion. Mr H. Dawson has left for Clinton where he will be in charge of the wrecking of a disused P.G.E. trestle. Miss Lillian Svarich of Rossland is visiting her aunt and uncle, Mr and Mrs Alex Sullivan of the Squamish Hotel. Miss Rose Hemings of Toronto is visiting her sister Mrs George Carson. Of special interest is the fact that the two sisters have not seen each other for 18 years. Miss Hemings will remain for the Dawson-Carson nuptials. Mrs Norman McDonald and daughter Heather have gone to Williams Lake to visit Mrs Alex McDonald. Mr H. A. Munro has left for Williams Lake where he is supervising the building of the new home of his daughter and son-in-law, Mr and Mrs Stan Good. Mr and Mrs Earl Judd with Philip and Gwenyth are motoring to Banff for a two week holiday. Mr and Mrs Harley and baby Grace have left for Saskatchewan where they will visit among Mrs Harley's relatives. Mr Bill Manners has come back to Squamish where he is assisting his parents behind the counters of the Red and White Store. Doreen and Billy Swann of Vancouver have spent the past month visiting their grandparents, Mr and Mrs A. P. Barnfield. Miss Connie Lee of Clinton is visiting her grandmother Mrs W McCush. Mrs W. Seymour and Danny visited Mr W. Seymour Jr. in Seattle, travelling by plane. Boyce Crappelle has returned from Williams Lake where he has been holidaying for six months. Mr and Mrs Les Keith with their daughter from Chilliwack, are visiting Mrs M. Armstrong. Mrs Frank Buckley has as her guests, Miss Marjorie Lean and Miss Gertrude Robertson, who taught here formerly. Now teaching at Kelowna, they say weather in the interior is no better than here. Mr and Mrs A. Hutton and their daughter Agnes are visiting friends across the line in Washington. Mr and Mrs Keith Green have moved into their new home in the Southridge Subdivision, the first dwelling to be completed in the new residential district. Last rites for Mrs William Pethick aged 89 who died at D'Arcy on August 8, were held at the Chapman Funeral Home in Vancouver. A figure well-known to all trainmen, Mrs Pethick had been an invalid for some time. She is survived by her husband, one daughter in London, England and a son in Connecticut. OUR PRODUCTS SHIPPED TO ALL POINTS ON P.G.E. WE ARE ONE OF THE PIONEERS INTRODUCING THE NEW SYSTEM OF LOGGING - THE SKYHOOK. HOWE SOUND TIMBER IS ONE OF TWO LOGGING OPERATORS USING THIS SYSTEM IN BRITISH COLUMBIA. The residents of Woodfibre are very pleased to welcome the Sub-Branch of the Bank of Nova Scotia at Squamish, which has been opened here under the management of Mr Dunn. The Bank has already proved of great value to the community and no doubt will prove more so as time progresses. It is located opposite the Post Office, part of No. 3 Bunkhouse having been renovated and converted for this purpose. The Bank will be open two days each week, namely, on the 1st, 2nd, 8th, 9th, 15th, 16th, 23rd and 24th of each month. Banking hours are from 12 noon until 5 p.m.
Miss May Franson and Miss Ruth Cooper have gone to Vancouver where they will attend the Duffus School of Commerce. WHETHER YOU WANT JUST A SNACK OR A FULL COURSE MEAL, WE HAVE A SPLENDID ASSORTMENT OF DELICIOUS FOODS TO PLEASE YOU... AND OUR PRICES WILL PLEASE YOUR PURSE TOO! STOP IN TOMORROW... BRING YOUR FAMILY... YOU'LL ENJOY IT! WE ARE NOW STOCKED WITH A COMPLETE LINE OF PARTS, TIRES AND ACCESSORIES. The week of August 22nd was a red letter period in the lives of the P.G.E. office staff. The new offices were ready for occupation. To see the building today one finds it hard to believe that last winter a drab army hut stood on the same ground. The exterior is finished in the new P.G.E. colours, soft green walls with dark green trim, red roof and red door; not to forget the cement sidewalk along the front. with other new P.O.E. buildings are under consfderation. flat-bottomed rowboat went down the Squamish River from Buckley's Crossing. Upon investigation, a three-foot piece of rope, attached to the anchor, showed signs of having been cut with a knife. The owner of the rowboat, Alex Munro, would appreciate any information leading to the recovery of the missing craft. With a new fence in the rear of the school and a new coat of paint inside, the school opened its doors to the young people of Squamish on Tuesday, September 7th. Taking the place of C.C. Whitlock as principal is Ernest Hayes of Lillooet. Mr A.E. White is returning as assistant high school teacher. Mr Patterson is taking Mr Sweeney's place, while Miss Loretta Chalmers is the new primary teacker. Mrs R. Webster, Mrs F. Caldwell and Mr R. Cherry are returning to familiar rooms. On Thursday, September 9th at 8 p.m. the Squamish Parent Parent Teachers are holding a housewarming for the new members of the teaching staff as part of their regular meeting. The rear of the school yard has acquired the new look. A neat new picket fence now separates the school yard from the mill road. Amazing what a difference even a fence can make. The marriage took place at Olds, Alberta on August 1st, of Thomas Valdez and Mary Beuntjen, both of Squamish. While visiting the groom's people, the couple, who had planned to marry somewhat later were persuaded to hold the ceremony in the midst of the family circle. Mr William Kaiser was his brother's best man while Mrs Kaiser was matron of honour. After the wedding, the family, 22 in number, sat down to a wedding dinner. Best of luck, Mr and Mrs Valdez. Born to Mr and Mrs Norman McDonald at Williams Lake Hospital, a son. A son was born to Mr and Mrs C. Leffler (nee Marjorie Lasser) of Parksville, at the Nanaimo General Hospital on August 11th. To Mr and Mrs Carl H. Smith at Rosetown, Saskatchewan, a sister for Penny and Wendy on August 17th. 2ND SUNDAY - 9:30 AM H.C.
Friends of Mr and Mrs Bill Cottingham will be interested to know that they are now living in Westview. Mr and Mrs W.C. Bazley spent Labour Day weekend in Chilliwack attending the wedding of Mr Bazley's sister. WHEN YOU TRAVEL REMEMBER THE "BONABELLE"
British Columbia Pulp & Paper Company Limited, who donated $250; Branch 181 of the Canadian Legion, who had undertaken all expenses in connection with bringing the band to Woodfibre; The Community Club, who were providing the Orchestra for the Dance in the evening; Mr J. Plecas, for his donation of one thousand winners; Mr J. Spink, for the prizes for the Dance; J. Haar and C. Lea for the prize for the boat race; the employees of the British Columbia Pulp & Paper Company for their donation between $200 and $300; the Truck Drivers, the Committee and all the people who had worked on the floats, etc., to make the day a success. The prize giving and speeches were followed by the Senior Sports at the Ball Field and a Children's Picture Show in the Community Hall at three o’clock. After supper, at 6 p.m, the Woodfibre Ball Team defeated the Capilano Highlands team with a score of 14 to 1, and at 7:30 the Band gave a concert in the Main Street in front of the Legion Hall, which was very much enjoyed by all. to make a successful dance. The Bishop of Lincoln has given three Anglican clergymen authority to practise divine healing. In a secluded lot next to Mr and Mrs Ingraham's an unusual building is being constructed. Made of logs, it will serve as a base camp in Squamish for Diamond Head Chalet. Mr and Mrs Emil Brantvold and the former's brother Ottar operators of the popular holiday resort, are erecting the building. Built in the Norwegian style familiar to the Brant vold Brothers; the structure will feature a sod roof, on which flowers will be planted. In a short time, they hope to take their horses and Bambi up to Paul Ridge. Bambi, you know, is the pet deer raised on a bottle by Mrs C.B. Smith. When Bambi got too big for town life, the Brantvolds took him up to the Chalet where he has been a definite attraction. At present there are about twenty guests at Diamond Head, among them Dr. Claude Dolman with his wife and three children, and Mr. Mrs. Ftjonald Klinck. of four cougars shot in the valley within a month. in the, Anglican Church on the evening of Monday, September 20th. Both Miss Carson and her fiance are well-known here, having spent the major part of their lives in Squamish. On October 1st, Mr Ernest Espinosa familiarly known as Spike will give up his work as mail clerk. For two four-year contracts, eight years in all, Spike has taken the local P.G.E. mail to and from the trains. Comes slides, snow or derailment it was Spike's job to get the mail sack to its destination. Due to ill-health, he regretfully gives up his work. During the past year he has been unable to keep up his regular routine and D. Smith has taken his place. But on October 1st the mail bag will be in someone else's hands. A veteran of the First World War, Mr Espinosa came here from some 25 years ago to work on the cement blocks on the Mamquam. Although officially retired he will continue to occupy his house on the dyke. Announces change in train service. Effective Sunday, September 12 trains No. 3 and No. 4, between Squamish Dock and Lillooet, on Tuesday, Thursday and Saturday, will be withdrawn. Effective Monday, September 13, steamship will leave Union Steamship pier on Monday, Wednesday and Friday at 9:00 a.m. instead of 9:30 a.m. as heretofore, connecting with train for all points - Squamish Dock to Quesnel, BC. SQUAMISH TOWING AND CONTRACTING CO., LTD.
To many Canadians, “Whv doesn’t somebodv do something?” is an almost instinctive expression indicating a situation beyond their control. But to the many Boards of Trade throughout the land it is the signal for action, the call to arms... especially when the "something" has to do with community betterment. This is only natural. For over the years Boards of Trade have devoted their energies and talents to bring the “somebody” about affair - both business and civic - that affect communitv life. And in so doing they have established a successful record based on just such service. The work any Board of Trade does is in direct proportion to its support. Your local board is no exception. Have them repaired before it is too late. Many, many months extra wear can be obtained by repairing your shoes at the right time.